“Curry House” claims to be the only restaurant in Prague which offers Sri Lankan national food. A second restaurant of its chain, all-you-can-eat buffet, has home-like atmosphere, ridiculously small prices, and a whole new cuisine to try. HOW IT STARTED: with a big love. A young Czech woman went to Sri Lanka and met a big man with a big heart; they fell in love and got married. The man’s name is Wasantha Demuni, and he’s now a chef in his own restaurant in Prague. The first “Sri Lankan Curry House” is quite popular, but the second one has been only working for 3 week and has yet to become recognized. WHAT’S INSIDE: a small, bright place is covered with accessories which are taken directly from Sri Lanka, such as colorful carpets with depicted elephants and gods. Its cozy aura comes from hanged pictures, taken from a family archive. One of them is a Demunis’ wedding photo: the bride and the groom wear tradional Sri Lankan wedding costumes and big smiles on their faces. Some walls are covered with maps, pictures of endless beaches in the Indian ocean, ancient ruins, rainforests, and happy Sri Lankan places. Buffet usually has three to nine customers, who like to enjoy their food and drinks in a quiet, relaxing atmosphere. Young customers also enjoy their stay in a kiddie corner. WHAT TO EAT: all food for the buffet comes from the former restaurant, which is two metro stations away. Main cources are divided into four parts and can satisfy meat-lovers with a pork, chicken or fish curry. Vegans can try a soya meat or vegetable curry. Such dishes as dhal (cereal-like lentil), white rice, fried rice, soup and salads are also on the list. Traditional Sri Lankan food can be very spicy, but guests in the “Sri Lankan Curry House” can try food which is not spicy at all; in addition, menu changes every day. Non-alcoholic and alcoholic drinks are also available, but for additional price. STAFF: the buffet itself doesn’t need too many staff members, so it usually has one or two waiters. One of them is Demuni wife’s mother. With “I don’t speak good English, but I’m learning” phrase, she can support her words with showing a table English dictionary and nevertheless speaking of Sri Lankan culture, showing items around the buffet and telling Sri Lankan tales related to them. Coming here seems like a great way to teach someone English, or learning Czech through the exotic culture. PRICES: buffet offers all their dishes available for 99 czk and a takeaway for 80 czk, excluding the drinks. HOW TO GET THERE: the address is Legerova 76, Praha 2, which is 10 minutes from Wenceslas square. The nearest tram and metro stations are I.P. Pavlova and Museum. OPENING HOURS: Monday-Friday 11.30 – 19.30 hrs (the buffet’s booclets are not updated though and state opening time as 11.00 – 18.00 hrs). 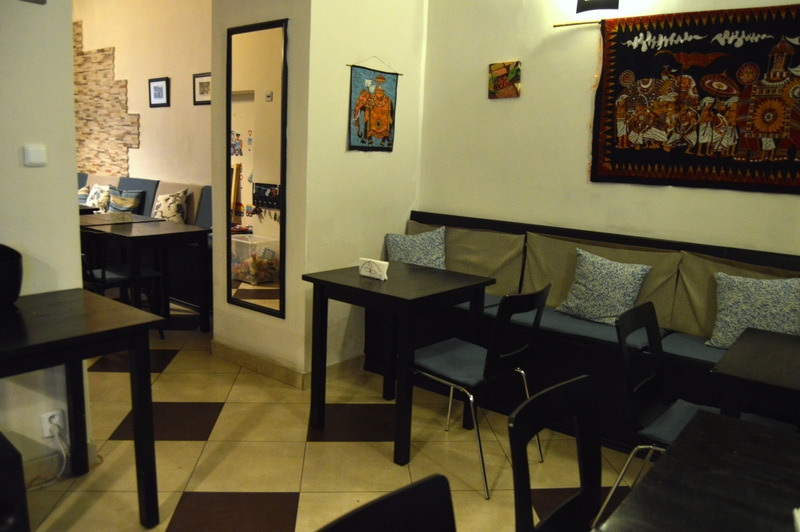 Visit Sri Lankan’s Curry House website (available both in Czech and English). Note, that the price for the buffet and opening hours are not updated.